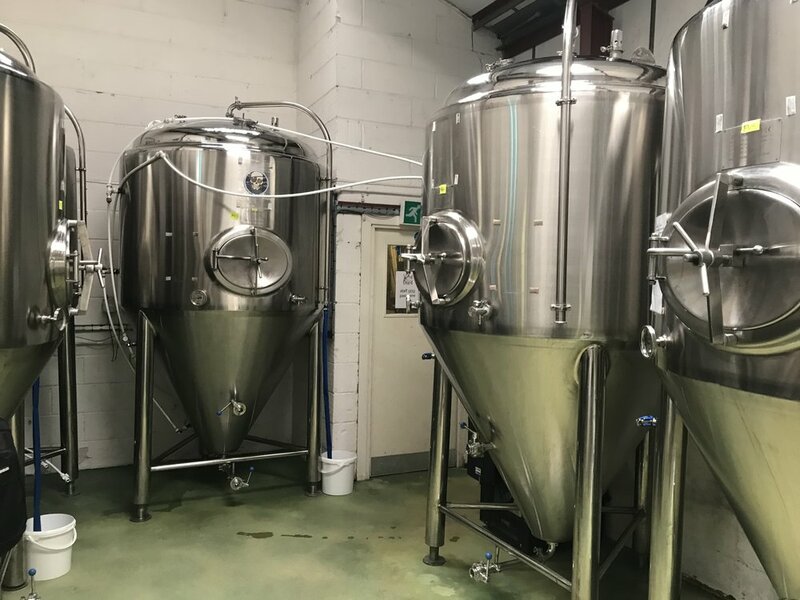 Once a season (or thereabouts), West London's Weird Beard Brew Co. open up their brewery for an open day where punters can turn up and drink from their wide range of beers either on draft or in bottles. These open days also serve as an opportunity to launch a new beer or two and to offer some special releases to take away exclusively sold at the brewery only. I first came across Weird Beard many years ago when I had only recently started drinking more exciting beers. I opted for a bottle of their superb Five O'Clock Shadow in a restaurant - a big American IPA that packs a mass of hops and all of the bitterness. 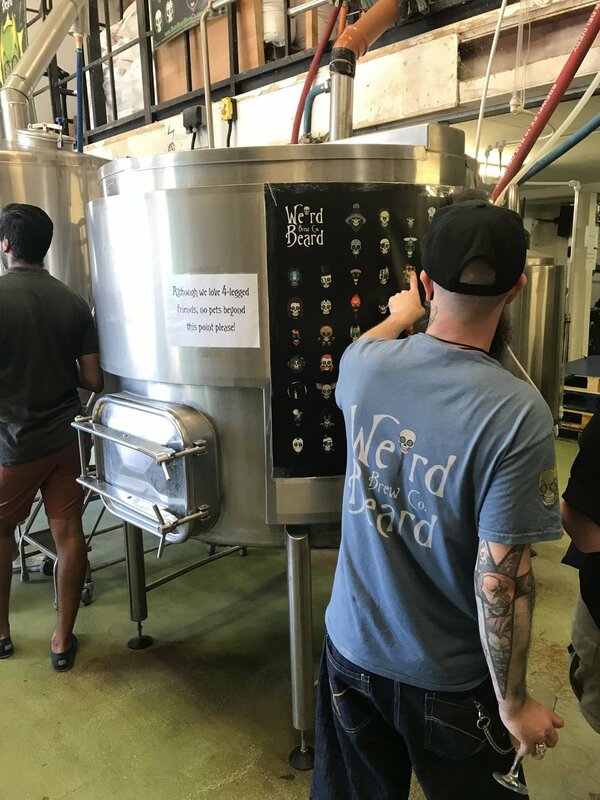 I was a little taken aback by how much flavour there was in the beer and have kept my eye out for Weird Beard's wares ever since. The perfect combination struck when I noticed Weird Beard were hosting an open day and I found myself with no plans so decided to go along. It got even better when I realised the brewery is only about a 25 minute journey from my flat. It got better still when I checked the weather and saw it was forecast to be lovely sunny day. The bus ride and short walk to the Hanwell-based brewery passed by in no time and it wasn't long before we had arrived. The open day runs from midday to 8pm so we did the sensible thing and rocked up around 12:30pm. Weird Beard actually own two units on the trading estate it is situated on; the first unit houses the brewery proper and the second unit handles all of their takeaway sales (as well as containing all the barrels for their barrel-aged beers - more on those later). There was a really welcoming atmosphere throughout the afternoon from both the staff working and all of the people in attendance - this is clearly a brewery that people in West London are very proud of and it was clear a community and friendships had been formed through it. Food was provided by Beefinity & Viande which smelt delicious - big hunks of meat served with Asian sauces and sides. The sous vide beef rib looked exceptional. Alas, we had already made food plans afterwards so resisted temptation. The brewery boasted seven beers on tap and a staggering twenty-three different bottles to drink in. Of those seven beers on tap, three were new releases and two were new batches of existing beers. I clearly needed to try all of these and so settled on halves of everything I'd not had before (six of the seven beers on offer). The beers were reasonably priced at £2.50 for a half pint and £5 for a pint. Click the images below to see the bottle and tap list! First on the hit-list was My Own Summer (4.8%), a new double dry hopped oat pale ale that was the perfect compliment to the glorious sunshine beating down (My better half may have had three halves of this because it was so delicious!). The brilliantly named Hello, Grisette Me You're Looking For (4.1%) came next - a, you guessed it, grisette brewed in collaboration with Unity Brewing. A light, hoppy grisette on a sunny day is another great combination so this also went down way too easily. Going three-for-three with good-styles-to-drink-in-the-sun came Kill Pils - Olicana hop edition (5%), a new hop addition to this pilsner. Pilsner and sunshine is an absolute no brainer and I had soon drank three beers in a very short space of time. It was around about then that I decided a break from the sun and chinning beers was in order so I sidled over to the unit selling take-out beers for a perusal. The list was pretty overwhelming and I spent far too long poring over it. Prices here ranged from £2.50 to £6 which was fantastic value for money so it was almost rude not to buy some bottles. I did the sensible thing and ordered one of every barrel-aged beer they had all of which sound very exciting. Beers to tuck away for when summer is over I feel as I'm not sure how enjoyable they would've been on the type of day we were having with the sun beaming down. I am particularly intrigued by the barrel-aged DIPA - something I don't think I've ever come across before. I headed back to the bar to sample the remaining beers. Next up was Weird Beard's kettle sour, Sourslave - Mosaic hop edition (4%), another beer style that lends itself well to warm weather. This was a great balanced sour and was a welcome change of pace to the three previous beers. My beer of the day was Death Growl (8.6%), a honey and lemon tripel brewed with Solvay Society. This was beautiful and floral and sweet and sour and glorious and I implore you to seek it out. Final beer of the afternoon was an Imperial Schwarzbier brewed with Norwegian's Haandbryggeriet, Dirrty Haands (9.8%). This really didn't taste like it was just shy of 10% and was delicious - a big malty punch followed by slight smoke but still retaining the light body you'd expect from a black pilsner. As I was starting to melt in the heat (did I mention it was sunny?) and had sampled all that I aimed to, we decided to call it a day and head home. Inside an hour, I was back home on the sofa having a well earned nap. Drinking is tiring work. 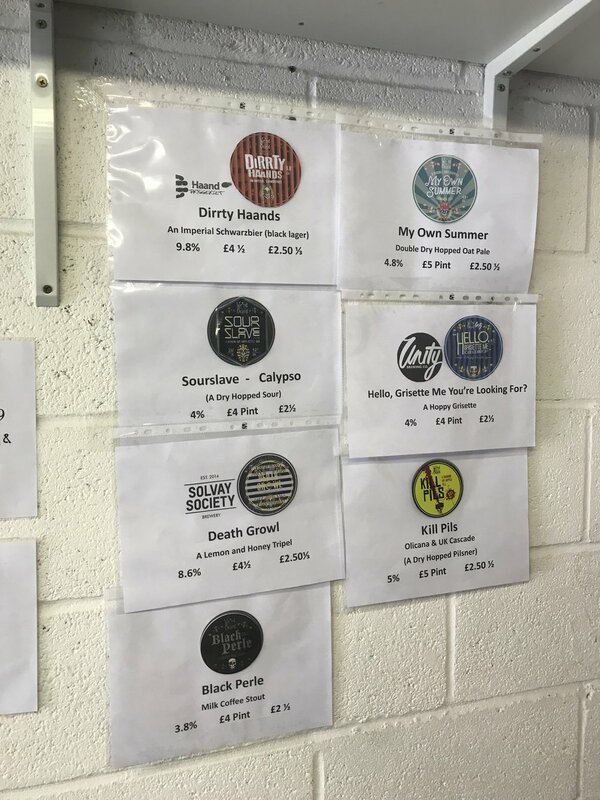 I'm hoping I'm around for the next open day because I had a great time and highly recommend popping along if you're at a loose end or in the mood to drink some great beer in a friendly, relaxed environment. Until next season!